The project manager must continually be aware of the status of the project. Is the project progressing to plan or is it behind schedule? Is the project likely to be over or under spent? Is the unit cost of the new product on target? 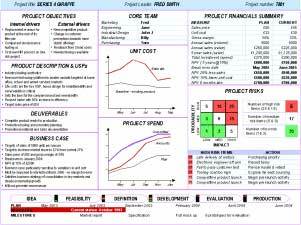 Are project risks being managed proactively? Are the project objectives clear and agreed by all? Managing this complex data and providing meaningful reports can be a time consuming and laborious task. Furthermore, different project managers may report on these issues in different ways, depending on their experience and skills. 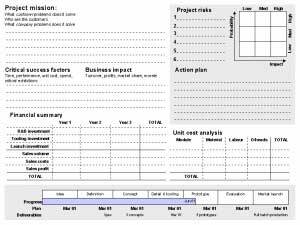 Also known as a project dashboard, the 'project on a page' document has a dual use, providing an accessible summary of objectives and status to the project team, while also forming a simple, high level project status report for senior management. It provides a consistent way of presenting project status which can be used by all project managers. It is expected that the summary will be supported by appropriate documentation to enable a more detailed analysis if required. Determine how the information of measure is to be presented. Can it be graphed, is a table appropriate or will some other visual suffice? Will the page be A3 or A4. Is all of the information included absolutely critical? Two different approaches are illustrated below.